Running throughout May at Circus Street, this piece takes first fiddle to our activities, and we will be shutting up shop for the duration. Wednesday April 23rd and Thursday 24th we will be open as normal, but after this we will be taking a break from the bike sales and public workshop side of things. 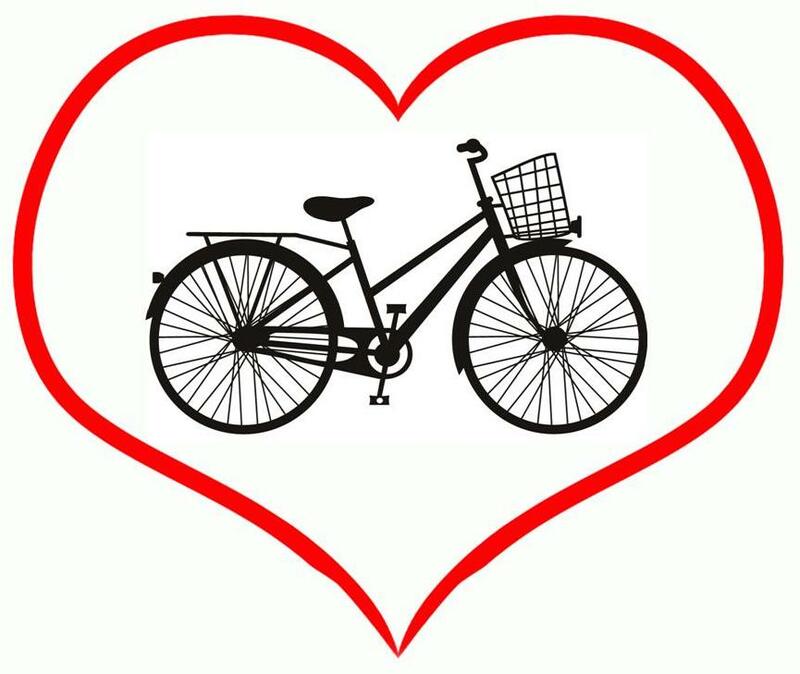 We will still be doing stuff – catching up with paperwork, preparing bikes for sale and taking stock of our first two months of trading – we will still be taking on new donations and new volunteers and may be able to arrange some open events, and will return as normal in June. If you would like to donate a bike during May, please contact us before bringing it down – use the form HERE. Also, if you would like to become a volunteer, let us know HERE. In the meantime, the Festival piece looks fantastic (and its free) so do given it a go, and see you all again at the BikeHub in June. Imagine you are leaving Brighton. 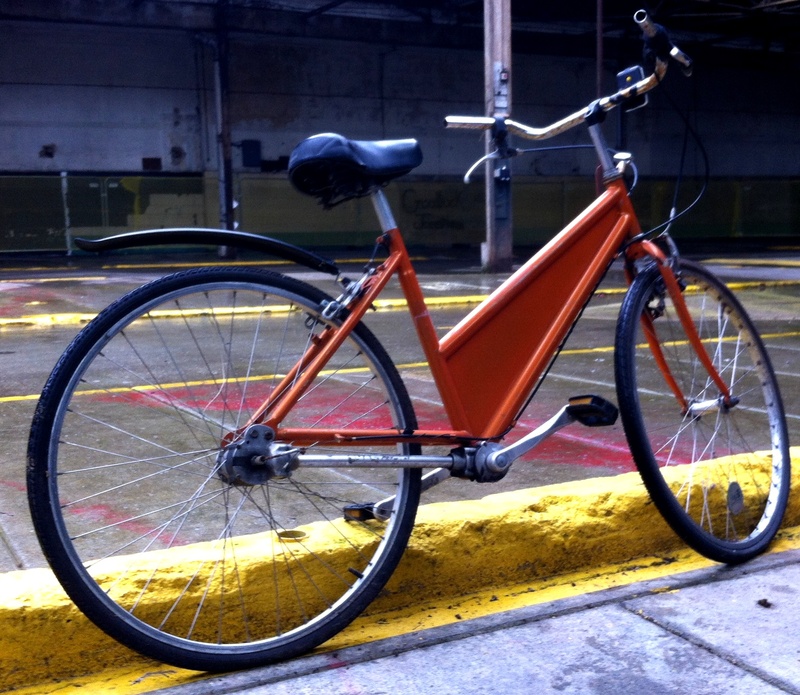 Imagine you have a bike – not a great one, not much resale value but is has served you well. Your bike cannot come with you. What shall you do with it? You could get it along to the council recycling centre (Tip) where they will do with it what they do with it. All good but you need to take it there, which can be a barrier for some. Also, its your bike. Many people like their bikes as have served them well, and feel a bit sad having to dump them, and you are that sort of person. You need another option. Perhaps Freegle. You can give it away to someone else. We wholeheartedly recommend Freegle as one of the best places for stuff you don’t want, but your imaginary self needs your bike right up to the minute you notionally go, and you don’t have time or place to organise it. Maybe you just leave it. Maybe you just attach it to a nearby lampost or bike stand, lock it and go. “Its OK” you say “I’m not *actually* dumping it. This isn’t *really* flytipping. 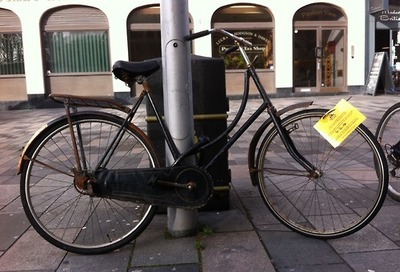 I’m just leaving it here till I get time to sort it out…..” and even as you walk away, the voice in your imaginary head tells you this is not true – that you will never return to the bike and that it will rust away until the council come to collect it…. This is what a lot of people do – and this was the challenge we took to Brighton CityCamp last weekend. 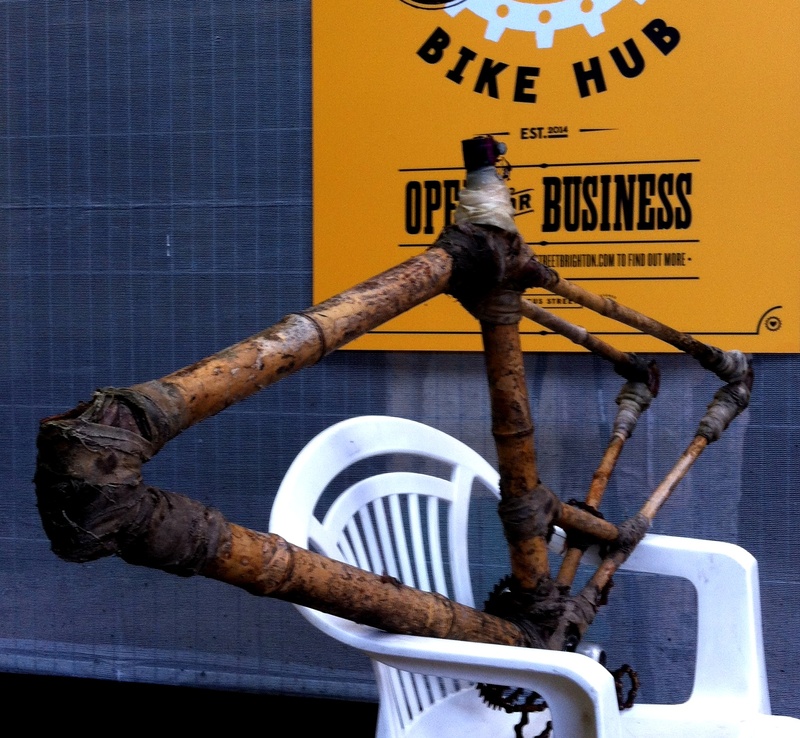 How to make it easier for people to donate their unwanted bikes to us when they are still working, rather than leaving them to rust on the railings in the Brighton brine until the only cycling they will see is the (re)cycling of component parts. Brighton CityCamp – billed as a ‘social innovation hack weekend’ – is a get together of positive thinkers with ideas on how to Make Brighton Better. It has an Unconference format, with no ‘top table’ dominating and the agenda and actions set by participants, who pitch their idea and try to enthuse others to join in and help turn it into an actionable project. 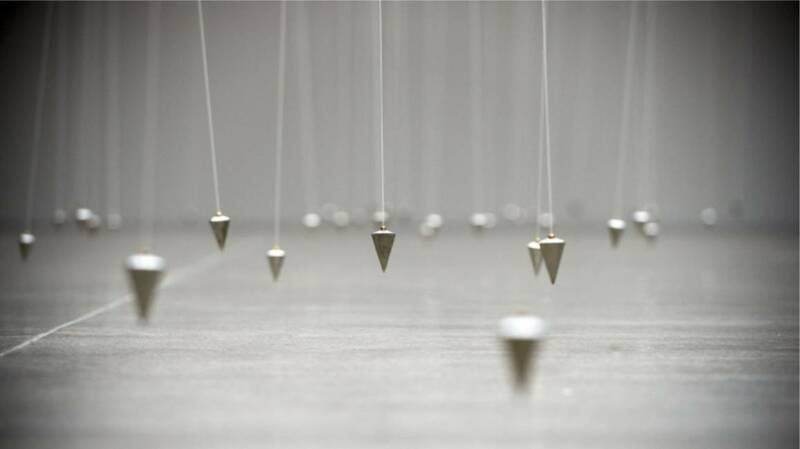 Money and resources are made available to help the best proposals teeter to reality. On the day, a host of CityCampers came forward to help us with our challenge – how to reduce bike abandonment and increase supply of useful bikes – and we not only got tips on how to adjust our online presence, but also came up with our project proposal – BikeBank. Briefly, its about setting up physical spaces in the city where bikes can be easily and securely left – like book banks, toy banks or shoe banks – and collected by us for refurbishment and re-use. We have some work to do and people to see in properly developing it, but the good news is that the CityCamp judges saw something in it and declared us joint winners of the cash prize to get it going! We have been properly running for a couple of weeks now. The main business has been a steady stream of cyclists sprucing their steeds for spring & mostly wanting help with brakes and gears. We have blocks and cables – this we can help with – and the best thing is that anyone who turns up for tweaking has a good chance of being able to do it for themselves next time. The other thing going on is the donations. 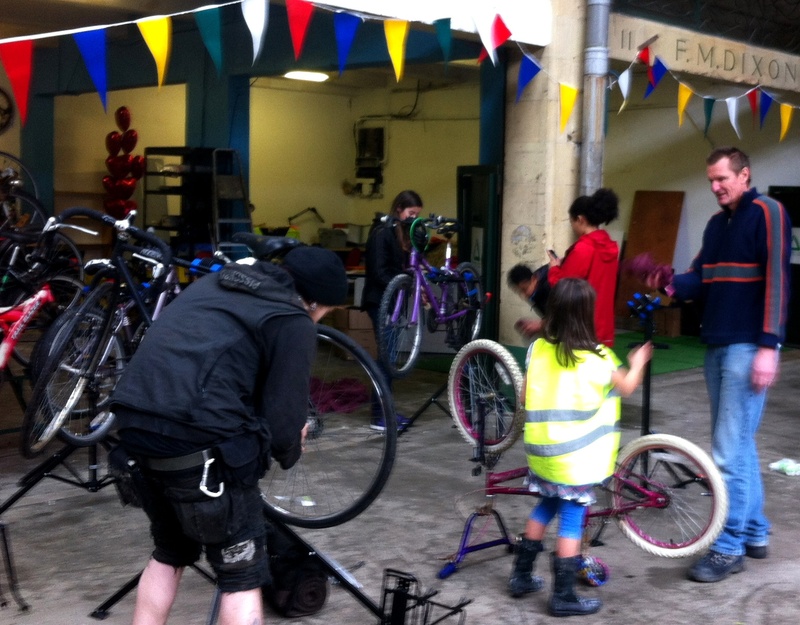 We have been overwhelmed by the support shown by individuals and institutions to furnish us with a whole ride of bikes – some at the end of their useful life, but with salvageable parts, but most just needing a bit of TLC to get them on the road again. Our most common enquiry has been “can I buy one?” – and to this, the answer at the moment has been NO. Its not that we don’t want to let them go, its just that the process of getting even the most chipper machine up to the standard where we can take your money for it takes a bit of time…. and here is where we have a backlog. and this part is where we really need your help to get us properly going. 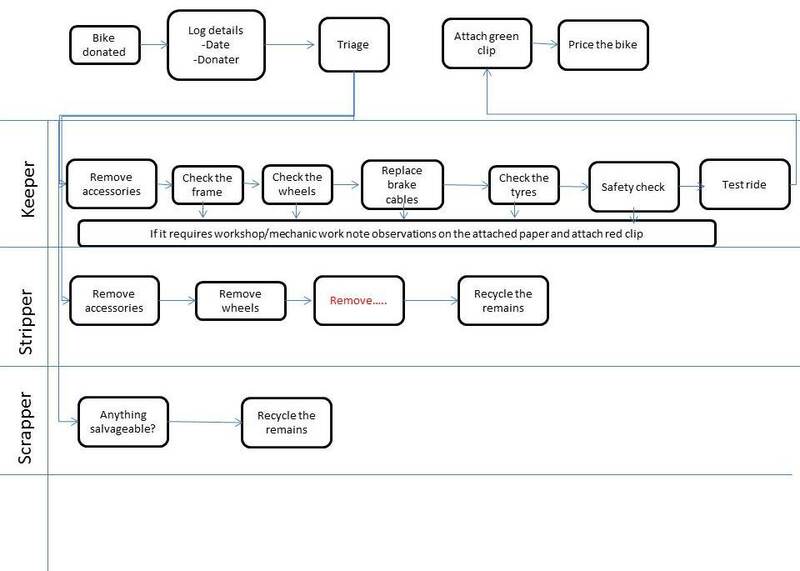 Volunteers can come in with any skill level – as you see from the chart, there are all sorts of tasks involved from basic assessment, picking up skills by taking bikes to bits, or applying your knowledge in making them fit for the streets. Its this bit – the goodwill and support of volunteers keen to learn – which our whole endeavour hangs on. If you have some time to spare, drop by and give it a go. Our first actual day! Worries that no-one would come were soon dispelled as the workshop space filled up quickly with people wanting advice on how to spruce their machines up for the spring or to use the workshop for more complex. For much of the day we had up to 10 different bikes being worked on, and the Dr Bike support session attracted half a dozen people wanting to brush up on basic safety checks and maintenance. Hot soup was served. They will join the growing stock of donated bikes which we are starting to sort out in readiness for repair. If you have a bike you no longer want, do drop it down to us. Also if you have some bike repair skills you would like to donate this would be especially welcome. Tomorrow ( a change from the published schedule) will be ELECTRIC BIKE DAY. Want some help up those hills, come and give an electric bike a spin and find out what they are all about. Also will be Dr Bike & DIY repair sessions. All welcome – do come. 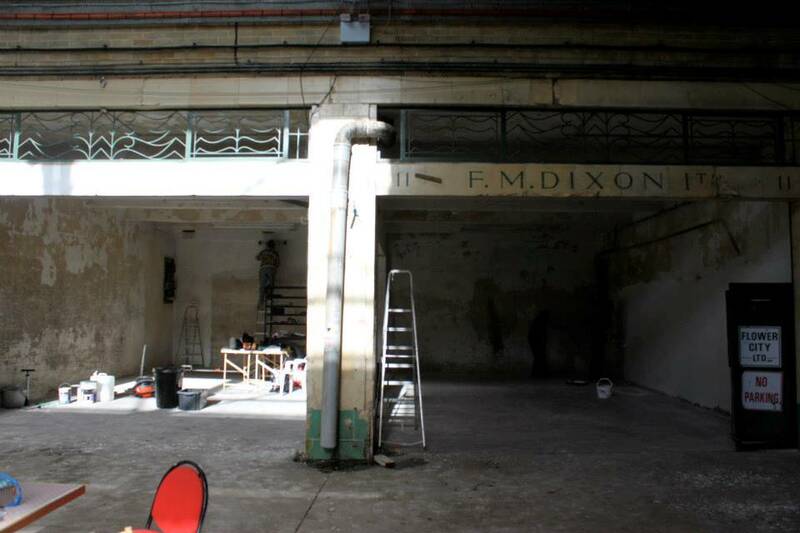 At the start of February when we entered the space at Circus Street which – thanks to Cathedral Group – we had been given to house our first workshop, it looked like this…. We had no tools, no furnishings – not even any bikes! But we had a few good people and a heap of goodwill. The first thanks goes to Ian and Ian for immense practical work, fixing the lights and shutters, building the workbench and tool board and generally being capable and rocklike in getting his thing going. 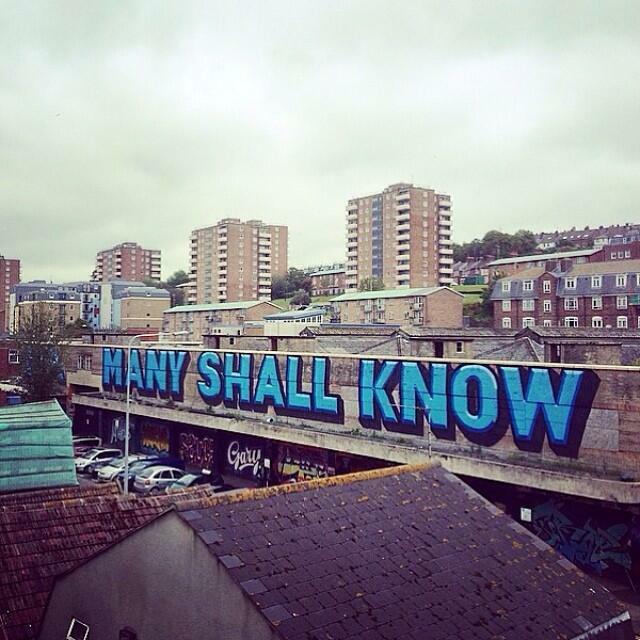 Also to all of the others – students at Sussex and especially the small group of homeless men who helped out with the painting. Ace – one and all! Making the place seem like home is majorly down to Kat from Freegle, who opened up her stores of good things – many originating from Brighton & Hove City Council offices as they seek to downsize. Making the place seem like a bike workshop owes much to Cranks, who have lent their expertise, provided practical items and helped with sourcing our tools. Finally the bikes. The same day they this website went live we received three offers and they have been coming in steadily ever since but our big boost came from Brighton Station, who offered us 52 bikes which had been abandoned at the station and on trains to get us going. Transported in an electric vehicle by the fabulous Magpie co-op, they are an excellent assortment and will be back on the streets of Brighton as soon as we can manage. 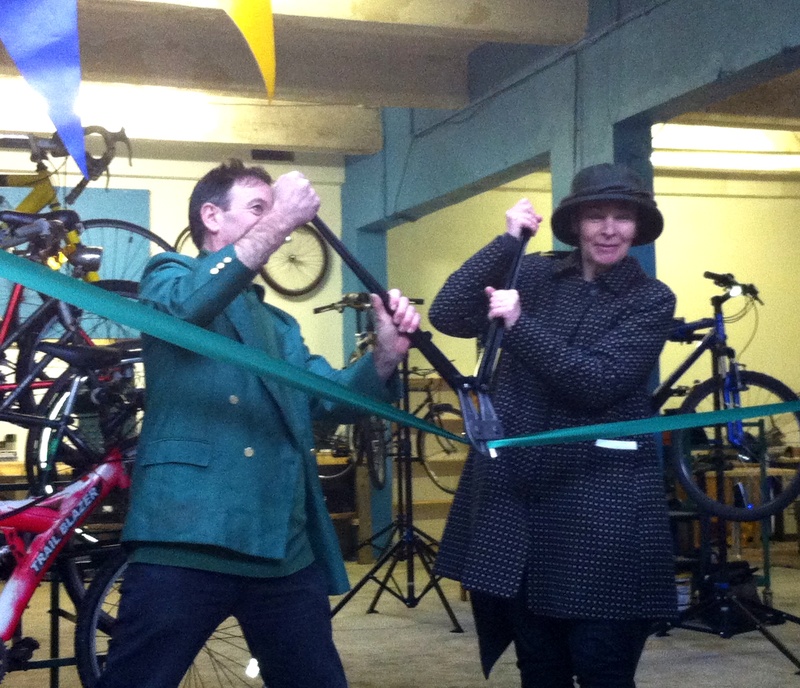 We had our official launch on February 14th (Caroline Lucas MP and Groundwork South Project Manager Duncan Blinkhorn cut the ribbon below) and will be open each Saturday henceforth from 11-3, with further dates to be announced, and next week we will be hosting the first Brighton Love Your Bike week. Do drop by.